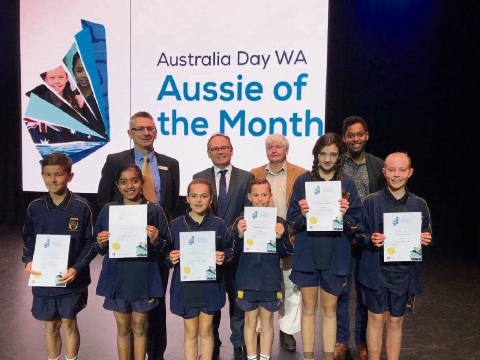 THE 2017 WA Young Australian of the Year Abdullahi Alim and WA Senior Australian of the Year Peter Kenyon were joined by Mandurah MLA David Templeman when they visited Mandurah Baptist College year 6 students at a special Aussie of the Month assembly. Abdullahi Alim spoke about the college’s value of integrity and what it meant to him and challenged students to write down what they were passionate about. He also shared his passion for helping communities and his work on The Lighthouse Strategy, which aims to address issues of contemporary concern through Hackathons – a series of fast-paced and intense exercises where teams are given 48-72 hours to develop a prototype product, service or strategy.